As of today, George Taylor Rd has passed the Pressure Test! Samples have been taken from Lake Rd and Park Meadows. Starting tomorrow, our contractor will have a team installing meter boxes in Park Meadows and Deerfield. A crew will be headed to 9 Foot Rd to install services that had been missed and then they will proceed to Kings Chase next week. West Carteret Water Corporation thanks you for your continued patience and looks forward to serving our new members! If you have any questions or concerns please call the office at (252)393-1515 or email us at water@wcwc.biz. Water line construction is underway in the Lake Road Area. The $300 pretap fee will end soon. If you have not paid the fee and completed a membership application, you should contact our office immediately before the fee increases to $750. Once the water line passes your property, the tap fee increases to $2,400. Questions about the construction and fees should be directed to the office at (252) 393-1515. October 30, 2018: Your water company is finally very pleased to announce that a contract to complete the water line installation has been signed. The contract has been awarded to Sunland Development in Newport. Sunland has been frequently involved with WCWC projects and we have a high sense of confidence in their work ethic and ability to complete this project in the manner that is expected. Their Notice to Proceed was issued effective November 1, 2018. They will have a period of time that will be needed to mobilize and basically "pick-up" where the previous contractor abandoned the project on Lake Road, Nine Foot Road, and Roberts Road. Once they are underway, they will then give us a predicted schedule about one month in advance of where they plan to be working. It is anticipated that they will finish the area as just mentioned before moving onto Hwy 24, eastward towards subdivisions along that corridor and Hibbs Road. With the change in contractor, there is a needed change in our tap fee process. In previous projects, the $300 tap fee expired when the contractor began working. We have not done that in Phase V, but we are needing to finalize our tap locations. Therefore, please note that the tap-on fee will increase from $300 to $750 for Lake Road, Nine Foot Road, and Roberts Road on December 15, 2018. It will then increase to $2,400 once the water line is finished and released for hook-up. Next, George Taylor Road and Bluewater Banks should make plans to do the same. The deadline in those areas will be shortly thereafter. If you wish to get a tap, please do so immediately. Call our office at (252) 393-1515 or email water@wcwc.biz. You DO NOT need to remit the full payment. You can pay $50 per month or make whatever payment arrangement works best for you financially, but do not miss this opportunity. If you have already purchased a pre-tap and have not indicated where you wish for your meter to be placed, mainly in the Nine Foot, Lake Road, and Roberts Road areas, contact us immediately as well. Thank you again for your patience and we will update this page as information becomes available to us. The contract with the interim contractor, Mortec Construction, has been signed and processed. Mortec will be onsite April 30, 2018 to begin repairs to roadways and clean-up. We anticipate waterline construction to begin again around June 15, 2018. We truly appreciate your patience. A letter along with hook-up instructions will be/was mailed on March 1, 2018. We encourage you to contact our office is you have any questions. Also, an interim contractor will be selected on March 13th to work on the water lines that are installed, but not completed along Nine Mile, Nine Foot, Lake Road, and Roberts Road. This contactor will also make repairs to damages in these areas. We are working with the bonding company to quickly bid the remaining protion of this contact. A new contractor will be selected soon to complete the Phase V construction project. As the schedule is prepared, we will keep you apprised. We appreciate everyone's patience during this matter. Newport, North Carolina February 1, 2018 – West Carteret Water Corporation ("WCWC") has been advised that the primary contractor for Phase V construction, Tony E. Hawley Construction Co, Inc., has filed for bankruptcy and probably will be unable to complete the project. This will cause an unforeseeable and unavoidable delay to the Phase V expansion project. WCWC is working closely with Hudson Insurance Company, the bonding company for the primary contractor, to secure a contractor to complete the work as expeditiously as possible. We will provide project updates to the WCWC website and Facebook page as additional information becomes available. We also suggest you sign up for alerts to receive email or text updates on the Phase V project and other WCWC news. Should property owners have specific issues arising out of this work that need immediate attention, please contact WCWC's Repair Department via the website, or call the office at 252.393.1515 during regular business hours. WCWC regrets any disruption this unanticipated event and delay may cause to our current and future customers. West Carteret Water Corporation is a nonprofit, member-owned water utility serving western Carteret County along the coast of North Carolina. WCWC's Phase V project was approved in March 2015 to expand WCWC's services to a number of locations in the Hwy 24/Hwy 58/Roberts Road/9-Mile Road areas. Construction began during the fall of 2016 and is ongoing. Crew #4: Is continuing their work up Nine Mile Rd towards Lake Rd/Nine Foot Road. They anticipate being at or near station 244+00 (Lake Rd) in the next 3 weeks. Once they are there, they will continue up Lake Rd. Crew #3: Anticipates completing Blue Heron Bay by the end of October, weather permitting. Once Blue Heron Bay is completed, Crew #3 plans on moving over to finish Bur Oaks around the first week of November. Crew #1: Has completed the tie-in at Hwy 24 & Nine Mile Rd, and has the first directional on Nine Mile along with Croatan Colony, Gales Creek, and Southwest Drive tied-in. Crew #1 is now beginning to fill and test Nine Mile Rd from Hwy 24 towards Southwest Dr. After they complete their testing, they will begin working on Roberts Rd. The Boring Crew anticipates having their work at the intersection of Bur Oaks/Nine Mile Rd and Nine Mile/Nine Foot Rd completed towards the end of the first week of November. This mailing outlines what you can expect regarding the installation of the water main and your water service. Please review it entirely and do not hesitate to contact us if you have any further questions. Crew #1 – Continuing on Nine Mile Road towards Lake Road/ Nine Foot Road installing 8" water line. Crew #2 – Continuing North on Nine Mile Road from Southwest Drive and completing subdivisions on the West side of Nine Mile Road. Brynita Lane will be next followed by Bur Oaks Blvd. (Including all adjacent streets and cul-de-sacs per plans). 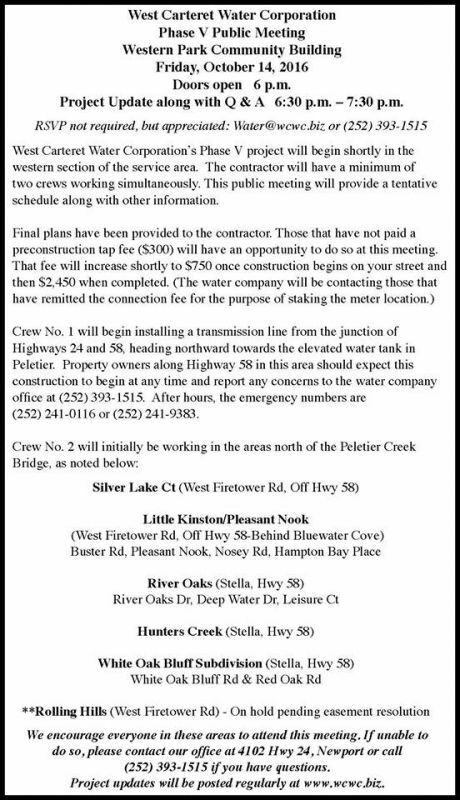 Crew #3 – Beginning work within Bogue Forest Drive followed by Blue Heron Drive. Possible Crew #4 added before August 31 - This crew will work on connecting Nine Mile Road and Hwy 24 before assisting to finish the last 2,000 feet on Nine Mile Road along with connecting the subdivisions and side streets along Nine Mile Road to that water main. CONSTRUCTION AREA: We will work closely with our contractor to complete the construction with as little inconvenience and disruption to your property as possible. All concrete driveways will be bored. Yard ornaments or other landscaping within the right-of- way should be removed to avoid possible damage. We can provide flags to be used to locate irrigation lines or anything else of significance within the right-of-way. URGENT – METER LOCATION: The contractor will attempt to install some water services during the water line installation. For a limited period of time, you will have the option of deciding where to install your water meter. If we do not receive a response from you indicating where you wish to have your water meter installed, we will locate it in a position that we believe to be most reasonable. However, as the property owner, you best know where your utilities and septic are located. If you are having a difficult time deciding, call us to make an appointment for someone to visit with you. Visiting the office at 4102 Hwy 24, Newport. Our office hours are Monday through Friday from 8:30 a.m. to 5:00 p.m. If you are unable to do so, make an appointment for us to come to your home by calling 252-393-1515. The meter will be installed where the property line meets with the right-of-way line anywhere along the front of your lot. Our contractor will determine how far off the roadway shoulder the meter will be located, but you must determine the position to the right, middle, or left of your lot. You may need to consult with your plumber to decide the best location to minimize the plumbing that will be needed. In most cases, this is dependent on the well location and if you decide to use the line between the well and the building as a tie-in point. Keep the water meter and customer water line at least 10 feet away from sewer lines or drain fields and keep the meter at least 5 feet away from utility poles and utility pole guide wires. We encourage you to continue to use your well for outdoor watering, but you must not have any interconnections between your existing well and water meter. That is an illegal connection. If the service is to be installed on a vacant lot, please consider potential future uses of that property and possible locations of driveways, septic fields, etc. You will be provided with a Hook-Up Guide when you get your flag. However, please read the additional Hook-up Information at the end of this letter. Once the flag is placed, call our office to let us know you are ready for us to record the location. Our staff will paint a “S” or dashed marked on the pavement in front of your flag to indicate to the contractor that we have confirmed the installation of the service. For those that are not local, we have enclosed a sheet that you can use to give us a detailed drawing where you would like the service to be installed. Our staff will place a flag for you based on that drawing. However, we encourage you to verify that location before the meter is installed to ensure proper placement. Provide as much information as possible, including distances from objects, boundaries, etc. WCWC recognizes that your plumbing may not be accustomed to higher pressures. Also, you may have leaks of which you are not aware. Because of those reasons, WCWC will be lenient with our adjustment policy during the first 6 months after releasing the water line for consumption. Based on that, we will adjust 100-percent of leak related water usage for accounts that connects to their meter within the first 3 months of availability. After that period of time, the normal adjustment policy will apply, which is 50% of the usage above the average. (WCWC does not adjust for leaks in irrigations systems, outdoor hoses, swimming pool connections, or outbuildings.) More information regarding the hook-up with be included in your next letter. You can now begin the hook-up process using the appropriate enclosed guide. Although connecting to your water meter can be completed when you wish, the water line extensions were approved for funding based on anticipated water use. Therefore, we hope that you will choose to connect to the service, not only for this reason, but because it will also help us to maintain a higher quality of water in the newer areas. The Carteret County Permits and Inspections Department would ask that you get a permit for the plumbing. As mentioned, we have enclosed two hookup guides to assist either in answering your general plumbing questions or in giving you guidance with RPZ installations. • There is an electronic reading device (MTU) attached to the lid of the water meter. You can open the lid by inserting a screw driver in the notch and pushing forward to release the eyes holding it in place. Replace the lid after use to ensure it does not blow off or become dislodged, damaging the MTU. Take caution when mowing. If damaged, the cost of replacement is shared with the account holder. • Do not undersize or oversize the water line from the meter to the house. Generally, one-inch is recommended, but that depends on the number of fixtures in your home along with the line distance between the meter and the dwelling. • It is required to have your own personal shut off valve at the meter. A second is suggested at the home or building. • We also suggest a pressure reduction valve at the home side of the connection. It will keep a steady pressure throughout your home or business. Ultimately, it also reduces the amount of water that you use in a given period of time. • We encourage you to continue to utilize your existing well for outdoor purposes. However, please be aware that you must physically disconnect the well from your new service line. We reserve the right to inspect that disconnect and for the safety of all, will shut off your meter if a cross connection is found until it is disconnected. • If you are connecting the meter to a line that will supply water to a commercial building, swimming pool, irrigation system, or a dock, you must install a Reduced Pressure Zone Backflow Preventer or RPZ. As per code and suggested by Public Water Supply along with our Cross Connection Control Plan, RPZs must be installed by licensed plumbers and tested annually by a certified licensed backflow tester. The annual test results must then be forwarded to the water company. We can provide you with a list of approved testers, if necessary, or we can test for you. IMPORTANT: You may have leaks that you are not aware of because of being on a well system. Therefore, we will be tracking usage closely along with offering an enhanced leak adjustment. If you are curious about usage and possible leaks, please contact us. Your water meter is very precise and reads your meter several times per day. We can easily apprise you of your usage if you contact us. In the event of a leak, WCWC does have a leak adjustment policy whereby we will deduct 50% of the overage, which is based on your average or anticipated average. We also have a catastrophic leak adjustment that will reduce your bill to a maximum of $150 (currently). You are entitled to one every 12 months. However, for Phase V customers only, WCWC will adjust 100% of leak related usage for all bills rendered through January 15, 2018 where we receive a leak adjustment request (form available on-line or in our office) along with plumbing receipts for materials and/or labor. Your account must be connected by December 2017 to qualify for the 100% leak adjustment. This adjustment applies to interior/hard plumbing only. Once you have connected to your service, please contact our office. We will be visiting to ensure that you have a minimum of one personal shut off valve, which must be adjacent to the water meter. If you use the internet, please visit our website at www.wcwc.biz for information about our company. In the event of an outage, we would like to be able to quickly notify you. You can sign up for email and/or texted ALERTS on the web or by calling our office. You should also contact us for your initial password to the on-line bill payment option. This information and more will be included with your monthly water bill. We would like to welcome you as a user-member of West Carteret Water Corporation and encourage you to contact us with any concerns or questions that you may have. Phase V is still steadily moving along. We will soon certify the following Highway 58 areas: Hunter’s Creek Rd, River Oaks Subdivision, White Oak Bluffs, Silver Creek Court, and the Pleasant Nook Community. A leak in the new transmission line was found in a road bore, which caused our crew to undergo a slight delay in the White Oak Bluffs area. This leak was delaying our final inspection/approval for the entire western section of the water system. The contractor was asked to return to finish the cleanup in White Oak Bluffs, which they did. During that time, they also sanitized and pressure tested the water lines. With that being completed, the engineer issued an approval for all of the aforementioned streets to the NC Department of Environmental Quality, Public Water Supply Division. This agency’s certification is required before we can send letters informing everyone that the system is ready. This certification generally takes about thirty days, meaning customers should have it within the next three weeks! The contractor has also finished installing water lines in Croatan Estates and Gales Creek Road areas. They will begin installing the water line on Nine Mile Road within a few weeks. These subdivisions along with the others along Nine Mile Road will be connected to the line as completed. This section will take several months to complete as we continue to work towards Lake Road and Nine Foot Road. Along Highway 24, Bogue Forest will soon be under construction followed by Blue Heron Bay, as it stands now. Major road bores throughout the entire system will be completed simultaneously. As always, thank you for your continued patience and understanding with our Phase V Project. Should you have any comments, concerns, or questions, please do not hesitate to contact the office. West Carteret Water's Phase V Expansion is moving right along! Currently, water line is being installed in the White Oak Bluff Subdivision. Next month, construction is scheduled to begin in the following areas: Bogue Forest, Blue Heron Subdivision, Croatan Colony, Gales Creek Road, and George Taylor Road. Letters have been mailed out to customers in these areas, as a reminder to stop by our office and pick up a flag. Flags should be placed in the right of way where the property owner would like the meter to be located. If possible, existing utilities can be used as a guide. If you have any questions regarding flag placement, please contact the office during regular business hours. Phase V Water Line Construction is underway. We are working on clean-up in the White Oak Bluff Subdivision at this time. If you live in one of the subdivisions/streets listed on the attachment you are highly encouraged to contact the office, since construction will take place in these areas first. Those wishing to pay for a tap at the reduced rate of $300 should sign up now. Payment arrangements can be made. The tap fee will increase to $750 shortly and then $2,450 after the water line is installed. If you have any questions or would like to RSVP for the meeting (not required, but appreciated), please contact the office. West Carteret Water anticipates issuing Notices to Proceed to the contractor by mid-September and hopes to provide a tentative project schedule on the website by early October. 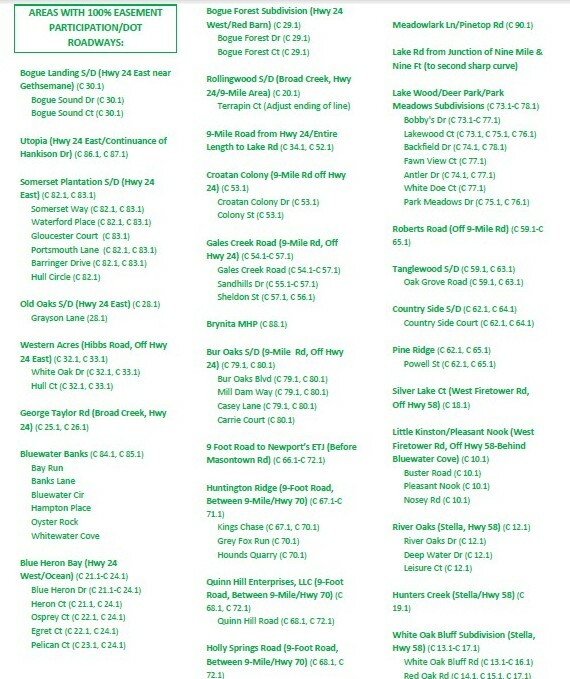 The pictures below show the updated distribution listing for the areas concerning the Phase V project. To enlarge a specific image, just click directly on it. If you have any questions, please contact the office. 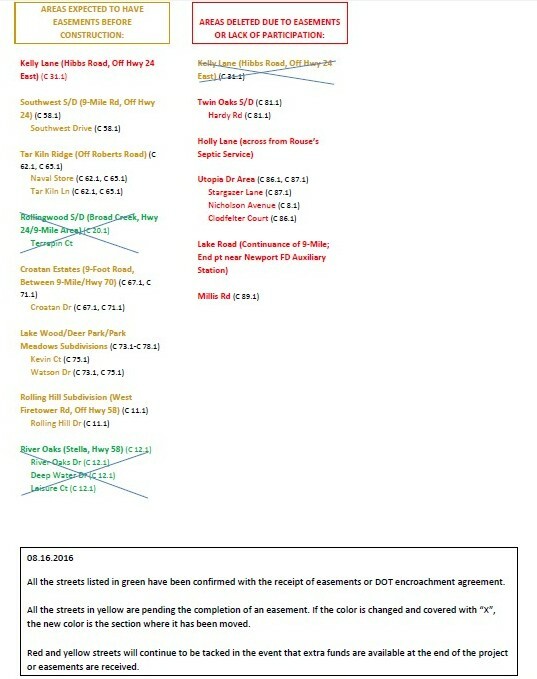 August 5, 2016: At last, the Phase V bidding process is about to end! Last week, we opened bids for the distribution expansion and additional well construction. Another bid opening will be held on Monday, August 8 for the Gales Creek elevated tank and the plant expansion. The Board will meet to discuss the overall project after all bids are opened. If over budget, subsequent funds will have to be borrowed. Those funds will be secured by Friday, August 12 to ensure that enough time is provided to finalize all paperwork and award contracts by August 25. Based on this schedule, it is anticipated that construction will begin within the next 60 days. Once the distribution contractor provides a tentative schedule, it will be posted. If you have any questions, please contact the office. As of Wednesday, June 29, 2016, we received approval to seek construction bids for the Phase V water line project. The bid opening will be held on July 28th and awarded within 30 days if bids are within the funding budget. If not, we will begin the deletion process to remove streets that are most costly. Of course, the more property owners that have signed up for water, the less cost per customer. Currently, the preconstruction fee is $300 per tap. That amount will increase to $750 once construction begins in each area. Eventually, it will be $2,400+. If you have not signed up for water and wish to do so, you are encouraged to contact our office to receive the necessary paper work. There will be an informational meeting on Tuesday, July 19, 2016 at the water company office. Doors open at 6 p.m. and the meeting will begin at 6:30 p.m. Please contact the office to RSVP as soon as possible. The list below contains the updated status of all the areas in West Carteret Water Corporation’s Phase V Expansion Project. All streets, regardless of status, are pending bid results. The next informational meeting will be announced in the Hwy 58 area. As of April 5, 2016, we have verbal notification that all agencies have approved the expansion. Our project will go to bid once those permits have been physically received and Rural Development gives their approval. The installation of water mains will be contingent on the bid pricing. A new update will be posted as soon as formal bids are made. As a reminder, if you have received an easement and have not yet executed it, please contact the office immediately. As of April 5, 2016, we have only recorded 66 out of 159. If you have any questions concerning easements, please contact the office as soon as possible. West Carteret Water Corporation is excited to be extending water lines into the previously advertised areas. However, due to negotiations with state and federal agencies regarding two well site placements and permitting, the bidding process for the Phase V project has been stalled. In a meeting with the agencies during late October, those involved felt that the approval could be forthcoming within 2-4 months. At this point, there is no reason to believe that the new sites will not be approved; it is just a matter of “when” they will be approved. To assist in this endeavor, a reputable well consultant, who is very familiar with both West Carteret Water Corporation and the Castle Hayne Aquifer, has been retained in an effort to provide creditable answers to their questions in a timely manner. The wells are just one of several contracts that will be funded through an $8.5 million loan from the USDA Rural Development, which includes water lines, plant expansion, meter change out, generated power, and elevated storage. Each of these contracts must be bid at the same time. WCWC could proceed without the well approval; however, it would be removed from eligibility for government loan funding during the phase of construction. At this point, that is not something we plan to do. Your board will be looking at this closely and, if necessary, will make the decisions needed to avoid extensive delays. Therefore, at current, we hesitate to give a firm bid date again, but anticipate February 2016 with a construction date of April 2016. All customers will be updated as we become aware of any changes. We apologize for this delay, but it simply cannot be changed or rushed by WCWC any more than it is already. At the same time, we appreciate the agencies involved for their stewardship to the public in making sure that every decision they make is in the best interest of the environment and our future aquifer health. Should you have any questions, please do not hesitate to contact our office at (252) 393-1515 or at lisa.smithperri@wcwc.biz. West Carteret Water Corporation received great news in March 2015. Our loan application for our Phase V project has been approved by the NC Office of USDA Rural Development. At this point in time, they expect to obtain approval from the Washington, DC office before the end of March and will deliver to us a Letter of Conditions by the first week in April. The Letter of Conditions is loan obligation. Based on that information, we have asked our engineering firm to proceed with final plans to prepare for bidding. Although a lot of survey work has been completed, we could not finish the entire construction package with the loan approval.